Sonic Stones represents two aspects of AustraLYSIS innovative work in computer mediated sound. One piece, Piano Stones, is an elaborate completed composed work, made entirely in the digital domain, though using and transforming natural stone sounds, and pre-recorded piano played by Dean. The work transits from the sound of the piano almost continuously to the sound of stones, and has strong references to the work of influential jazz pianist Bill Evans. The other piece Memeing ex Cathedra, is almost an hour long, and presents extended live computer-interactive improvisation, and was originally performed direct to air in a day-long international web cast. Multiple layers of rhythmic and textural process are superimposed, including elements from drum and bass, noise music, sampled keyboard and other diverse sounds. The whole is integrated into a large evolving structure. The CD is the sixth on Tall Poppies by AustraLYSIS, continuing their tradition of radical change and challenge: it is quite different from their previous work on the label. The performers are Director and Founder, Roger Dean, and long term collaborator Greg White, who both have extensive track records in composed and improvised music internationally. Additionally, Dean is intensively involved in research in music computation and cognition, while White is active as a music educator and as a film and media composer and sound designer. 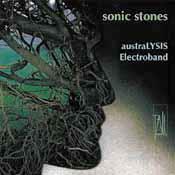 Sonic Stones is the latest release from the AustraLYSlS's Electroband. The line up includes Roger Dean on keyboards and computers and Greg White on computers and sound projection. It contains two pieces: Pianostones, which is a fully composed studio piece; and Memeing ex Cathedra, an hour long improvisation originally broadcast by the ABC as part of multinational webcast organised by William Duckworth and his Cathedral band in New York. Pianostones involves the digital manipulation of two fundamental sound sources: stone sounds recycled from the Hazel Smith work Nuraghic Echoes, and a previously released solo piano tribute to Bill Evans by Lysis called After Bill. The familiarity of the sound of the piano and the sharply identifiable scrunching of the stones is soon eclipsed as the piece progresses via digital manipulation. The contrasting sounds convolute until the piano converges on the stones to emit stone- like sounds of its own. The result is effective and enjoyable electronic music. Memeing ex Cathedra is an improvised soundscape using the MAX!MSP programming platform (MAX! MSP is the state of the art software package that allows musicians to develop interactive music performance software. It is a modular program with many existing shared routines or libraries; however, third parties can develop new routines). Memeing ex Cathedra is a concept piece where streams of sound are perceived as memes whereby some ideas will flourish, develop and spread, while others disappear. Input from Dean and White guides this selection process using synthesised sounds, samples and a MIDI-keyboard that are also sometimes driven by interactive algorithms. Lasting almost an hour, Memeing ex Cathedra is an epic journey through a variety of gradually morphing sonic landscapes. The resultant soundscapes are not as diverse or structured as might be anticipated in a musical work of this length. As Dean suggests, the improvised and conceptual nature of this work was a catalyst dissuading significant editing before release. The sounds move through a kind of slow release tension and release duality, gradually evolving between extreme dissonances and pleasant driving rhythms. Sonic Stones is a welcome addition to Australia's electronic music sphere and is likely to suggest many possibilities to the next generation of interactive composers and improvisers. Improvised music usually begs for an audience to complete an interactive and emotional circuit. That seems less essential with electronically generated improvisation. Not only may the increased control over sounds and their interrelationships make the studio a more ideal crucible than the concert hall, but the home-listening room may be a better place in which to absorb it. Play this through a good hi-ti and the sounds, despite their starkness, will make love to your speakers. Armed with sophisticated computers and programs, Roger Dean and Greg White sustain drama and suspense over the one-hour improvising trajectory of Memeing ex Cathedra, exhibiting acute instincts for application of the arts of tension and release, coherence and surprise, and preconception and extemporisation. Before this is the fully composed PianoStones, in which juxtaposed sounds of handled stones and piano gradually metamorphose into each other.